Holkham Hall. The severely Palladian south facade with its Ionic portico is devoid of arms or motif; not even a blind window is allowed to break the void between the windows and roof-line, while the lower windows are mere piercings in the stark brickwork. The only hint of ornamentation is from the two terminating Venetian windows. Holkham Hall (/ˈhoʊkəm/ or /ˈhɒlkəm/) is an 18th-century country house located adjacent to the village of Holkham, Norfolk, England. The house was constructed in the Palladian style for The 1st Earl of Leicester (fifth creation) by the architect William Kent, aided by the architect and aristocrat Lord Burlington. Holkham Hall is one of England's finest examples of the Palladian revival style of architecture, and the severity of its design is closer to Palladio's ideals than many of the other numerous Palladian style houses of the period. The Holkham Estate was built up by Sir Edward Coke, the founder of his family fortune. He bought Neales manor in 1609, though never lived there, and many other purchases of land in Norfolk to endow to his six sons. 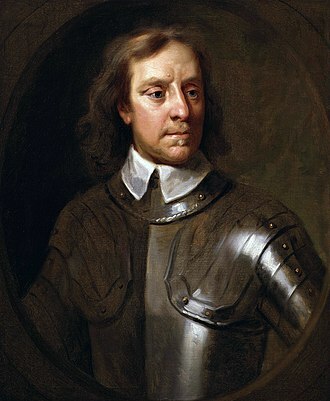 His fourth son, John, inherited the land and married heiress Meriel Wheatley in 1612. They made Hill Hall their home and by 1659 John had complete ownership of all three Holkham manors. It is the ancestral home of the Coke family, the Earls of Leicester of Holkham. The interior of the hall is opulently, but by the standards of the day, simply decorated and furnished. Ornament is used with such restraint that it was possible to decorate both private and state rooms in the same style, without oppressing the former. The principal entrance is through the Marble Hall, which is in fact made of pink Derbyshire alabaster; this leads to the piano nobile, or the first floor, and state rooms. The most impressive of these rooms is the Saloon, which has walls lined with red velvet. Each of the major state rooms is symmetrical in its layout and design; in some rooms, false doors are necessary to fully achieve this balanced effect. Holkham Hall. Foreground right: One of the four identical secondary wings. Holkham was built by 1st Earl of Leicester, Thomas Coke, who was born in 1697. A cultivated and wealthy man, Coke made the Grand Tour in his youth and was away from England for six years between 1712 and 1718. It is likely he met both Burlington—the aristocratic architect at the forefront of the Palladian revival movement in England—and William Kent in Italy in 1715, and that in the home of Palladianism the idea of the mansion at Holkham was conceived. Coke returned to England, not only with a newly acquired library, but also an art and sculpture collection with which to furnish his planned new mansion. 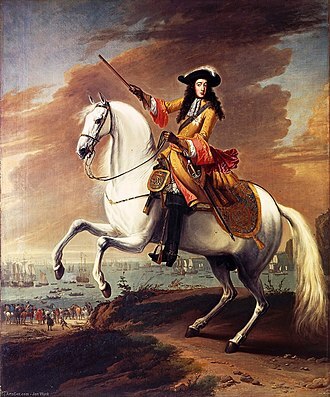 However, after his return, he lived a feckless life, preoccupying himself with drinking, gambling and hunting, and being a leading supporter of cockfighting. He made a disastrous investment in the South Sea Company and when the South Sea Bubble burst in 1720, the resultant losses delayed the building of Coke's planned new country estate for over ten years. Coke, who had been made Earl of Leicester in 1744, died in 1759—five years before the completion of Holkham—having never fully recovered his financial losses. Thomas's wife, Lady Margaret Tufton, Countess of Leicester (1700–1775), would oversee the finishing and furnishing of the house. Although Colen Campbell was employed by Thomas Coke in the early 1720s, the oldest existing working and construction plans for Holkham were drawn by Matthew Brettingham, under the supervision of Thomas Coke, in 1726. These followed the guidelines and ideals for the house as defined by Kent and Burlington. The Palladian revival style chosen was at this time making its return in England. The style made a brief appearance in England before the Civil War, when it was introduced by Inigo Jones. However, following the Restoration it was replaced in popular favour by the Baroque style. The "Palladian revival", popular in the 18th century, was loosely based on the appearance of the works of the 16th-century Italian architect Andrea Palladio. However it did not adhere to Palladio's strict rules of proportion. The style eventually evolved into what is generally referred to as Georgian, still popular in England today. It was the chosen style for numerous houses in both town and country, although Holkham is exceptional for both its severity of design and for being closer than most in its adherence to Palladio's ideals. Although Thomas Coke oversaw the project, he delegated the on-site architectural duties to the local Norfolk architect Matthew Brettingham, who was employed as the on-site clerk of works. Brettingham was already the estate architect, and was in receipt of £50 a year (about 7,000 pounds per year in 2019 terms) in return for "taking care of his Lordship's buildings". He was also influential in the design of the mansion, although he attributed the design of the Marble Hall to Coke himself. William Kent was mainly responsible for the interiors of the Southwest pavilion, or family wing block, particularly the Long Library. Kent produced a variety of alternative exteriors, suggesting a far richer decoration than Coke wanted. Brettingham described the building of Holkham as "the great work of [my life]", and when he published his "The Plans and Elevations of the late Earl of Leicester's House at Holkham", he immodestly described himself as sole architect, making no mention of Kent's involvement. However, in a later edition of the book, Brettingham's son admitted that "the general idea was first struck out by the Earls of Leicester and Burlington, assisted by Mr. William Kent". In 1734, the first foundations were laid; however, building was to continue for thirty years, until the completion of the great house in 1764. Simplified, unscaled plan of the piano nobile at Holkham, showing the four symmetrical wings at each corner of the principal block. South is at the top of the plan. 'A' Marble Hall; 'B' The Saloon; 'C' Statue Gallery, with octagonal tribunes at each end; 'D' Dining room (the classical apse, gives access to the tortuous and discreet route by which the food reached the dining room from the distant kitchen), 'E' The South Portico; 'F' The Library in the self-contained family wing IV. 'L' Green State Bedroom; 'O' Chapel. The Palladian style was admired by Whigs such as Thomas Coke, who sought to identify themselves with the Romans of antiquity. Kent was responsible for the external appearance of Holkham; he based his design on Palladio's unbuilt Villa Mocenigo, as it appears in I Quattro Libri dell'Architettura, but with modifications. The plans for Holkham were of a large central block of two floors only, containing on the piano nobile level a series of symmetrically balanced state rooms situated around two courtyards. No hint of these courtyards is given externally; they are intended for lighting rather than recreation or architectural value. This great central block is flanked by four smaller, rectangular blocks, or wings, and at each corners is linked to the main house not by long colonnades—as would have been the norm in Palladian architecture—but by short two-storey wings of only one bay. The external appearance of Holkham can best be described as a huge Roman palace. However, as with most architectural designs, it is never quite that simple. Holkham is a Palladian house, and yet even by Palladian standards the external appearance is austere and devoid of ornamentation. This can almost certainly be traced to Coke himself. The on-site, supervising architect, Matthew Brettingham, related that Coke required and demanded "commodiousness", which can be interpreted as comfort. Hence rooms that were adequately lit by one window, had only one, as a second might have improved the external appearance but could have made a room cold or draughty. As a result, the few windows on the piano nobile, although symmetrically placed and balanced, appear lost in a sea of brickwork; albeit these yellow bricks were cast as exact replicas of ancient Roman bricks expressly for Holkham. Above the windows of the piano nobile, where on a true Palladian structure the windows of a mezzanine would be, there is nothing. The reason for this is the double height of the state rooms on the piano nobile; however, not even a blind window, such as those often seen in Palladio's own work, is permitted to alleviate the severity of the facade. On the ground floor, the rusticated walls are pierced by small windows more reminiscent of a prison than a grand house. One architectural commentator, Nigel Nicolson, has described the house as appearing as functional as a Prussian riding school. The principal, or South façade, is 344 feet (104.9 m) in length (from each of the flanking wings to the other), its austerity relieved on the piano nobile level only by a great six-columned portico. Each end of the central block is terminated by a slight projection, containing a Venetian window surmounted by a single storey square tower and capped roof, similar to those employed by Inigo Jones at Wilton House nearly a century earlier. A near identical portico was designed by Inigo Jones and Isaac de Caus for the Palladian front at Wilton, but this was never executed. 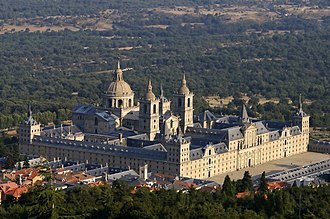 The flanking wings contain service and secondary rooms—the family wing to the south-west; the guest wing to the north-west; the chapel wing to the south-east; and the kitchen wing to the north-east. Each wing's external appearance is identical: three bays, each separated from the other by a narrow recess in the elevation. Each bay is surmounted by an unadorned pediment. The composition of stone, recesses, varying pediments and chimneys of the four blocks is almost reminiscent of the English Baroque style in favour ten years earlier, employed at Seaton Delaval Hall by Sir John Vanbrugh. One of these wings, as at the later Kedleston Hall, was a self-contained country house to accommodate the family when the state rooms and central block were not in use. The one storey porch at the main north entrance was designed in the 1850s by Samuel Sanders Teulon, although stylistically it is indistinguishable from the 18th-century building. Inside the house, the Palladian form reaches a height and grandeur seldom seen in any other house in England. It has, in fact, been described as "The finest Palladian interior in England." The grandeur of the interior is obtained with an absence of excessive ornament, and reflects Kent's career-long taste for "the eloquence of a plain surface". Work on the interiors ran from 1739 to 1773. The first habitable rooms were in the family wing and were in use from 1740, the Long Library being the first major interior completed in 1741. Among the last to be completed and entirely under Lady Leicester's supervision is the Chapel with its alabaster reredos. The house is entered through the Marble Hall (though the chief building fabric is in fact pink Derbyshire alabaster), modelled by Kent on a Roman basilica. The room is over 50 feet (15 m) from floor to ceiling and is dominated by the broad white marble flight of steps leading to the surrounding gallery, or peristyle: here alabaster Ionic columns support the coffered, gilded ceiling, copied from a design by Inigo Jones, inspired by the Pantheon in Rome. The fluted columns are thought to be replicas of those in the Temple of Fortuna Virilis, also in Rome. Around the hall are statues in niches; these are predominantly plaster copies of classical deities. The hall's flight of steps lead to the piano nobile and state rooms. The grandest, the Saloon, is situated immediately behind the great portico, with its walls lined with patterned red caffoy (a mixture of wool, linen and silk) and a coffered, gilded ceiling. In this room hangs Rubens's Return from Egypt. On his Grand Tour, the Earl acquired a collection of Roman copies of Greek and Roman sculpture which is contained in the extensive Statue Gallery, which runs the full length of the house north to south. The North Dining Room, a cube room of 27 feet (8.2 m) contains an Axminster carpet that perfectly mirrors the pattern of the ceiling above. 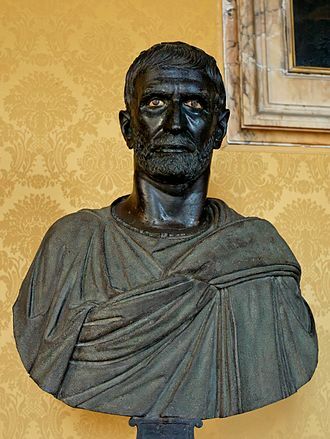 A bust of Aelius Verus, set in a niche in the wall of this room, was found during the restoration at Nettuno. 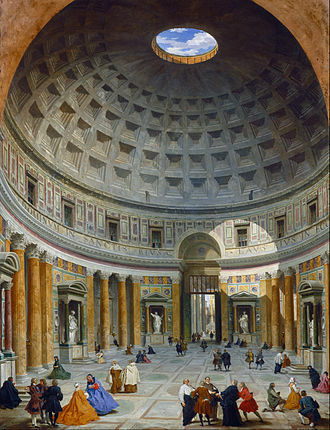 A classical apse gives the room an almost temple air. The apse in fact, contains concealed access to the labyrinth of corridors and narrow stairs that lead to the distant kitchens and service areas of the house. Each corner of the east side of the principal block contains a square salon lit by a huge Venetian window, one of them—the Landscape Room—hung with paintings by Claude Lorrain and Gaspar Poussin. All of the major state rooms have symmetrical walls, even where this involves matching real with false doors. The major rooms also have elaborate white and multi-coloured marble fireplaces, most with carvings and sculpture, mainly the work of Thomas Carter, though Joseph Pickford carved the fireplace in the Statue Gallery. Much of the furniture in the state rooms was also designed by William Kent, in a stately classicising baroque manner. So restrained is the interior decoration of the state rooms, or in the words of James Lees-Milne, "chaste", that the smaller, more intimate rooms in the family's private south-west wing were decorated in similar vein, without being overpowering. The long library running the full length of the wing still contains the collection of books acquired by Thomas Coke on his Grand Tour through Italy, where he saw for the first time the Palladian villas which were to inspire Holkham. The Green State bedroom is the principal bedroom; it is decorated with paintings and tapestries, including works by Paul Saunders and George Smith Bradshaw. It is said that when Queen Mary visited, Gavin Hamilton's "lewd" depiction of Jupiter Caressing Juno "was considered unsuitable for that lady's eyes and was banished to the attics". Was planned, planted, built, decorated. 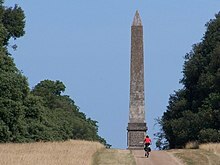 Under Coke of Norfolk, the great-nephew and heir of the builder, extensive improvements were made to the park and by his death in 1842 it had grown to its present extent of over 3,000 acres (12 km2). As well as planting over a million trees on the estate Coke employed the architect Samuel Wyatt to design over a number of buildings, including a series of farm buildings and farmhouses in a simplified neo-classical style and, in the 1780s, the new walled kitchen gardens covering 6 acres (24,000 m2). The gardens stand to the west of the lake and include: A fig house, a peach house, a vinery, and other greenhouses. Wyatt's designs culminated in c. 1790 with the Great Barn, located in the park half a mile south-east of the obelisk. The cost of each farm was in the region of £1,500 to £2,600: Lodge Farm, Castle Acre, cost £2,604 6s. 5d. in 1797–1800. The lake to the west of the house, originally a marshy inlet or creek off the North Sea, was created in 1801–03 by the landscape gardener William Eames. After his death, Coke was commemorated by the Coke Monument, designed by William Donthorne and erected in 1845–8 at a cost to the tenants of the estate of £4,000. The monument consists of a Corinthian column 120 feet (37 m) high, surmounted by a drum supporting a wheatsheaf and a plinth decorated with bas-reliefs carved by John Henning, Jr. The corners of the plinth support sculptures of an ox, sheep, plough and seed-drill. Coke's work to increase farm yields had resulted in the rental income of the estate rising between 1776 and 1816 from £2,200 to £20,000, and had considerable influence on agricultural methods in Britain. In 1850, Thomas Coke, 2nd Earl of Leicester, called in the architect William Burn to build new stables to the east of the house, in collaboration with W. A. Nesfield, who had designed the parterres. Work started at the same time on the terraces surrounding the house. This work continued until 1857 and included, to the south and on axis with the house, the monumental fountain of Saint George and the Dragon dated c. 1849–57 sculpted by Charles Raymond Smith. To the east of the house and overlooking the terrace, Burn designed the large stone orangery, with a three-bay pedimented centre and three-bay flanking wings. The orangery is now roofless and windowless. The cost of the construction of Holkham is thought to have been in the region of £90,000. This vast cost nearly ruined the heirs of the 1st Earl, but had the result that they were financially unable to alter the house to suit the whims of taste. Thus, the house has remained almost untouched since its completion in 1764. Today, this perfect, if severe, example of Palladianism is at the heart of a thriving private estate of some 25,000 acres (100 km2). Though open to the public on Sundays, Mondays and Thursdays, it is still the family home of the Earls of Leicester of Holkham. ^ "Holkham Hall". Collins Dictionary. n.d. Retrieved 23 September 2014. ^ Thomas Coke, 1st Earl of Leicester (fifth creation)(1697–1759), the builder of Holkham, should not be confused with his great-nephew Thomas Coke, 1st Earl of Leicester (seventh creation) (1754–1842), the celebrated agrarian known as "Coke of Norfolk", who also lived at Holkham Hall. Thomas Coke, 1st Earl of Leicester (builder of Holkham), died without surviving sons, hence his Earldom terminated. 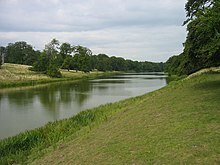 Holkham subsequently passed to Thomas Coke's nephew Wenman Roberts who assumed the Coke surname but could not inherit the title. 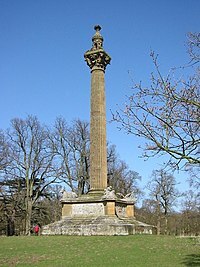 It was Roberts's son, Thomas Coke, born in 1754, for whom the title "Earl of Leicester, of Holkham in the County of Norfolk", was created in 1837. The new title was an honour granted in recognition of Coke's services to politics and agriculture. As this earldom was of a new creation, he too became the 1st Earl. It is his descendant Thomas Coke, 8th Earl of Leicester, who resides at Holkham today. The surname "Coke" is pronounced "Cook". ^ a b The Earldom of Leicester has been, to date, created seven times. 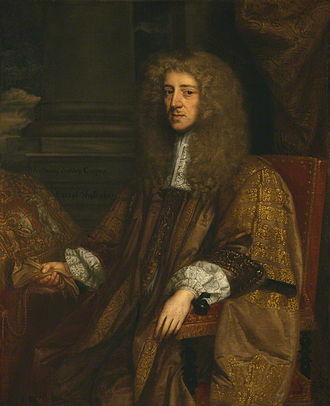 Thomas Coke, the builder of Holkham, was the 1st Earl of the fifth creation. His grand nephew Thomas Coke was the 1st Earl of the seventh creation. ^ a b c Hiskey, Christine. "The Building of Holkham Hall: Newly Discovered Letters". Architectural History. Volume 40, 1997. 144–158. ^ "Holkham Hall Archived 2012-02-12 at the Wayback Machine". Coke Estates Ltd. Retrieved on 19 June 2008. ^ Lees-Milne, James. "The Age of Inigo Jones". London: B. T. Batsford, 1953. 54–56. ^ Downs, Joseph. "The Tower Hill Room". Bulletin of the Pennsylvania Museum. Volume 21, No. 96, October 1925. 4–11. ^ a b Colvin, H. M. "A Biographical Dictionary of English Architects, 1660-1840". Cambridge, MA: Harvard University Press, 1954. 91. ^ "John Piper". Renishaw Hall. Retrieved on 2 March 2014. ^ Sicca, Cinzia Maria. "On William Kent's Roman Sources". Architectural History, Volume 29, 1986. 134–157. ^ "The Green State Bedroom Archived 17 February 2012 at the Wayback Machine". Coke Estates Ltd. Retrieved on 20 June 2008. ^ a b "Holkham Hall: Green State bedroom". BBC. Retrieved on 20 June 2008. ^ Benjamin, Clarke. "The British Gazetteer, Political, Commercial, Ecclesiastical, and Historical. Illustrated by a Full Set of Accurately Laid Down County Maps with All the Railways". H. G. Collins, 1852. 488. ^ Hassall, W. O. "Ilexes at Holkham". Garden History, Volume 6, No. 1, 1978. 58–60. ^ Dickinson, H. T. "A Companion to Eighteenth-century Britain". WileyBlackwell, 2002. 321. ^ "A Microcosm of Old England". Evening Gazette, Middlesbrough, England. 24 September 2005. 22. Brettingham, Matthew (1761). 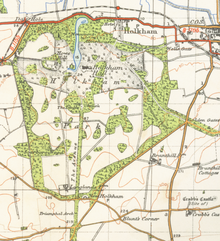 The Plans, Elevations and Sections, of Holkham in Norfolk. London: J. Haberkorn. Cropplestone, Trewin (1963). World Architecture. London: Hamlyn. Halliday, E. E. (1967). Cultural History of England. London: Thames & Hudson. Hiskey, Christine (1997). "The Building of Holkham Hall: Newly Discovered Letters." Architectural History vol. 40. Nicolson, Nigel (1965). Great Houses of Britain. London: Hamlyn. Schmidt, Leo and others (2005). "Holkham". Munich, Berlin, London, New York: Prestel. Summerson, John (1954). Architecture in Britain, 1530 to 1830. Baltimore, MD: Penguin Books. Wilson, Michael I. (1984). William Kent: Architect, Designer, Painter, Gardener, 1685–1748. London, Routledge & Kegan Paul. Wikimedia Commons has media related to Holkham Hall. The Ionic order forms one of the three classical orders of classical architecture, the other two canonic orders being the Doric and the Corinthian. There are two orders, the Tuscan, and the rich variant of Corinthian called the composite order. The Ionic columns are the thinnest and smallest columns out of the three canonic orders, the Ionic capital is characterized by the use of volutes. 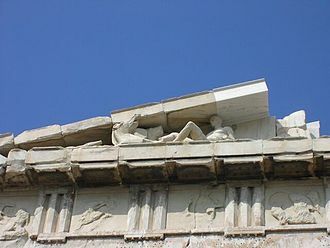 The Ionic columns normally stand on a base which separates the shaft of the column from the stylobate or platform, since Vitruvius a female character has been ascribed to the Ionic, in contrast to the masculine Doric. The major features of the Ionic order are the volutes of its capital, the only tools required to design these features were a straight-edge, a right angle, string and a compass. Originally the volutes lay in a plane, it was seen that they could be angled out on the corners. Ionic columns are most often fluted, after a little early experimentation, the number of hollow flutes in the shaft settled at 24. This standardization kept the fluting in a proportion to the diameter of the column at any scale. Roman fluting leaves a little of the surface between each hollow, Greek fluting runs out to a knife edge that was easily scarred. In some instances, the fluting has been omitted, mohr included 8 unfluted Ionic frontal columns on his 1928 design for the railroads St. Louis suburban stop Delmar Station. Pictorial often narrative bas-relief frieze carving provides a feature of the Ionic order. Roman and Renaissance practice condensed the height of the entablature by reducing the proportions of the architrave, the Ionic order originated in the mid-6th century BC in Ionia, the southwestern coastland and islands of Asia Minor settled by Ionian Greeks, where an Ionian dialect was spoken. The Ionic order column was being practiced in mainland Greece in the 5th century BC and it was most popular in the Archaic Period in Ionia. The first of the great Ionic temples was the Temple of Hera on Samos and it stood for only a decade before it was leveled by an earthquake. Inigo Jones was the first significant English architect in the early modern period, and the first to employ Vitruvian rules of proportion and symmetry in his buildings. As the most notable architect in England, Jones was the first person who introduced the classical architecture of Rome and he made major contributions to stage design by his work as theatrical designer for several dozen masques, most by royal command and many in collaboration with Ben Jonson. Beyond the fact that he was born in Smithfield, the son of Inigo Jones, a Welsh cloth worker, at some point before 1603 a rich patron sent him to Italy to study drawing after being impressed by the quality of his sketches. From Italy he travelled to Denmark where he worked for King Christian on the design of the palaces of Rosenborg and Frederiksborg, Jones first became famous as a designer of costumes and stage settings, especially after he brought masques to the stage. Under Queen Annes patronage he is credited with introducing movable scenery and this development suggests a second visit to Italy, circa 1606, influenced by the ambassador Henry Wotton. Jones learned to speak Italian fluently and there is evidence that he owned an Italian copy of Andrea Palladios I quattro libri dellarchitettura with marginalia that refer to Wotton and his architectural work was particularly influenced by Palladio. 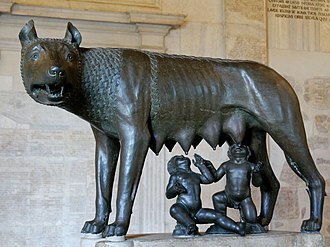 To a lesser extent, he held to the architectural principles of the ancient Roman writer Vitruvius. Joness first recorded architectural design is for a monument to Lady Cotton, circa 1608 and he devised a masque for the Prince and was possibly involved in some alterations to St Jamess Palace. On this trip, Jones was exposed to the architecture of Rome, Florence, Vicenza and his surviving sketchbook shows his preoccupation with such artists as Parmigianino and Schiavone. He is known to have met Vincenzo Scamozzi at this time and he was probably the first Englishman to study these Roman remains first hand and this was key to the new architecture Jones introduced in England. In September 1615, Jones was appointed Surveyor-General of the Kings Works, both James I and Charles I spent lavishly on their buildings, contrasting hugely with the economical court of Elizabeth I. As the Kings Surveyor, Jones built some of his key buildings in London, in 1616, work began on the Queens House, for James Is wife, Anne. With the foundations laid and the first storey built, work stopped suddenly when Anne died in 1619, work resumed in 1629, but this time for Charles Is Queen, Henrietta Maria. It was finished in 1635 as the first strictly classical building in England, employing ideas found in the architecture of Palladio and this is Joness earliest surviving work. The Banqueting House was one of several projects where Jones worked with his personal assistant, the Queens Chapel, St. Jamess Palace, was built between 1623 and 1627, for Charles Is Roman Catholic wife, Henrietta Maria. Parts of the design originate in the Pantheon of ancient Rome and these buildings show the realisation of a mature architect with a confident grasp of classical principles and an intellectual understanding of how to implement them. The other project in which Jones was involved is the design of Covent Garden square and he was commissioned by the Earl of Bedford to build a residential square, which he did along the lines of the Italian piazza of Livorno. The South Sea Company was a British joint-stock company founded in 1711, created as a public-private partnership to consolidate and reduce the cost of national debt. The company was granted a monopoly to trade with South America. At the time it was created, Britain was involved in the War of the Spanish Succession, there was no realistic prospect that trade would take place and the company never realised any significant profit from its monopoly. The Bubble Act 1720, which forbade the creation of joint-stock companies without royal charter, was promoted by the South Sea company itself before its collapse. In Great Britain, a number of people were ruined by the share collapse. The founders of the scheme engaged in trading, using their advance knowledge of when national debt was to be consolidated to make large profits from purchasing debt in advance. Huge bribes were given to politicians to support the Acts of Parliament necessary for the scheme, Company money was used to deal in its own shares, and selected individuals purchasing shares were given loans backed by those same shares to spend on purchasing more shares. 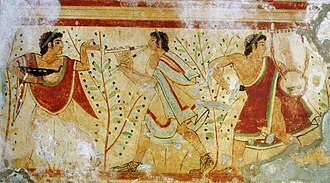 The expectation of vast wealth from trade with South America was used to encourage the public to purchase shares, the only significant trade that did take place was in slaves, but the company failed to manage this profitably. A parliamentary enquiry was held after the crash to discover its causes, a number of politicians were disgraced, and people found to have profited unlawfully from the company had assets confiscated proportionate to their gains. The company was restructured and continued to operate for more than a century after the Bubble, the headquarters were in Threadneedle Street at the centre of the financial district in London, today the Bank of England has headquarters on Threadneedle Street. At the time of events the Bank of England was a private company dealing in national debt. In August 1710 Robert Harley was appointed Chancellor of the Exchequer in a government of commission, the government at this time had become reliant on the Bank of England. This was a privately owned company, chartered 16 years previously, the government had become dissatisfied with the service it was receiving and Harley was actively seeking new ways to improve the national finances. 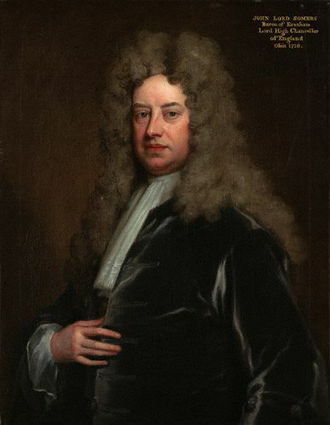 Richard Boyle, 3rd Earl of Burlington and 4th Earl of Cork, KG PC, born in Yorkshire, was the son of the 2nd Earl of Burlington and 3rd Earl of Cork and Juliana Noel. He is remembered for bringing Palladian architecture to Britain and Ireland and his major projects include Burlington House, Westminster School, Chiswick House and Northwick Park. Lord Burlington was born in Yorkshire into a wealthy Anglo-Irish aristocratic family, often known as the architect Earl, he was instrumental in the revival of Palladian architecture in both Great Britain and the Kingdom of Ireland. 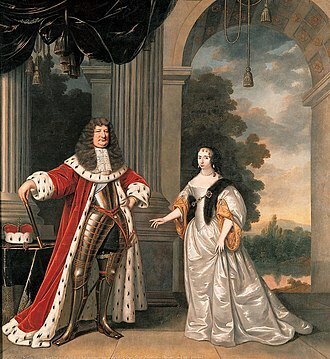 He succeeded to his titles and extensive estates in Yorkshire and Ireland at the age of nine, during his minority, which lasted until 1715, his English and Irish lands and political interests were managed on his behalf by his mother and guardian, the dowager countess Juliana. He showed a love of music. Georg Frideric Handel dedicated two operas to him, while staying at Burlington House and Amadigi di Gaula, three foreign Grand Tours 1714 –1719 and a further trip to Paris in 1726 gave him opportunities to develop his taste. His professional skill as an architect was extraordinary in an English aristocrat and he carried his copy of Andrea Palladios book I quattro libri dellarchitettura with him in touring the Veneto in 1719, and made notes on a small number of blank pages. In 1719 he was one of main subscribers in the Royal Academy of Music, Burlington never closely inspected Roman ruins or made detailed drawings on the sites, he relied on Palladio and Scamozzi as his interpreters of the classic tradition. With Some Additional Designs that were by Kent and Burlington, the important role of Jones pupil Webb in transmitting the palladian—neo-palladian heritage was not understood until the 20th century. Burlingtons Palladio drawings include many reconstructions after Vitruvius of Roman buildings, in the meantime, in 1723 he adapted the palazzo facade in the illustration for the London house of General Wade in Old Burlington Street, which was engraved for Vitruvius Britannicus iii. The process put a previously unknown Palladio design into circulation, the courtyard front of Burlington House, prominently sited in Piccadilly, was the first major executed statement of neo-Palladianism. 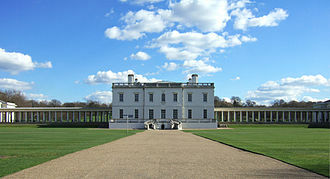 By the early 1730s Palladian style had triumphed as the accepted manner for a British country house or public building. For the rest of his life Burlington was the Apollo of the arts as Horace Walpole phrased it—, in 1739, Lord Burlington was involved in the founding of a new charitable organisation called the Foundling Hospital. Burlington was a governor of the charity, but did not formally take part in planning the construction of this large Bloomsbury childrens home completed in 1742, architect for the building was a Theodore Jacobsen, who took on the commission as an act of charity. Many of Burlingtons projects have suffered, from rebuilding or additions, from fire, brettinghams engraved publication of Holkham credited Burlington specifically with ceilings for the portico and the north dressing-room. Burlingtons architectural drawings, inherited by his son-in-law the Duke of Devonshire, are preserved at Chatsworth, in 1751 he sent some of his drawings to Francesco Algarotti in Potsdam together with a book on Vitruvius. 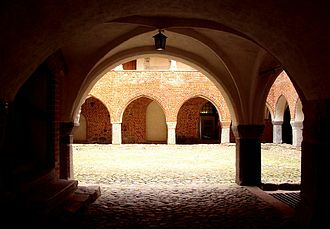 A courtyard or court is an enclosed area, often surrounded by a building or complex, that is open to the sky. Such spaces in inns and public buildings were often the meeting places for some purposes. Both of the court and yard derive from the same root. See yard and garden for the relation of this set of words, courtyards—private open spaces surrounded by walls or buildings—have been in use in residential architecture for almost as long as people have lived in constructed dwellings. The courtyard house makes its first appearance ca, Courtyards have historically been used for many purposes including cooking, working, playing and even places to keep animals. Before courtyards, open fires were burning in a central place within a home. Over time, these openings were enlarged and eventually led to the development of the centralized open courtyard we know today. Courtyard homes have been designed and built throughout the world many variations. Courtyard homes are prevalent in temperate climates, as an open central court can be an important aid to cooling house in warm weather. However, courtyard houses have been found in harsher climates as well for centuries, the comforts offered by a courtyard—air, privacy and tranquility—are properties nearly universally desired in human housing. Ur,2000 BC — two-storey houses constructed around a square were built of fired brick. Kitchen and public spaces were located on the ground floor, the central uncovered area in a Roman domus was referred to as an atrium. Today, we use the term courtyard to refer to such an area. Roman atrium houses were built side by side along the street and they were one-storey homes without windows that took in light from the entrance and from the central atrium. 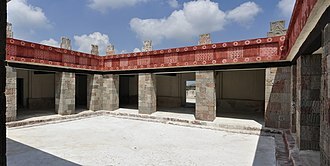 The hearth, which used to inhabit the centre of the home, was relocated, and these homes frequently incorporated a second open-air area, the garden, which would be surrounded by Greek-style colonnades, forming a peristyle. This created a colonnaded walkway around the perimeter of the courtyard, Courtyard houses in the Middle East reflect the nomadic influences of the region. It is subdivided into 100 pence. A number of nations that do not use sterling have called the pound. At various times, the sterling was commodity money or bank notes backed by silver or gold. The pound sterling is the worlds oldest currency still in use, the British Crown dependencies of Guernsey and Jersey produce their own local issues of sterling, the Guernsey pound and the Jersey pound. The pound sterling is used in the Isle of Man, the Bank of England is the central bank for the pound sterling, issuing its own coins and banknotes, and regulating issuance of banknotes by private banks in Scotland and Northern Ireland. Sterling is the fourth most-traded currency in the exchange market, after the United States dollar, the euro. Together with those three currencies it forms the basket of currencies which calculate the value of IMF special drawing rights, Sterling is the third most-held reserve currency in global reserves. The full, official name, pound sterling, is used mainly in formal contexts, otherwise the term pound is normally used. The abbreviations ster. or stg. are sometimes used, the term British pound is commonly used in less formal contexts, although it is not an official name of the currency. The pound sterling is referred to as cable amongst forex traders, the origins of this term are attributed to the fact that in the 1800s, the dollar/pound sterling exchange rate was transmitted via transatlantic cable. 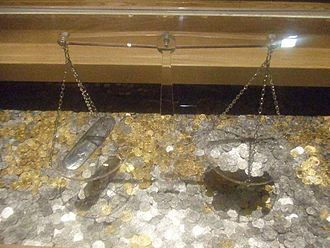 Forex brokers are sometimes referred to as cable dealers, as another established source notes, the compound expression was derived, silver coins known as sterlings were issued in the Saxon kingdoms,240 of them being minted from a pound of silver. Hence, large payments came to be reckoned in pounds of sterlings, in 1260, Henry III granted them a charter of protection. And because the Leagues money was not frequently debased like that of England, English traders stipulated to be paid in pounds of the Easterlings, and land for their Kontor, the Steelyard of London, which by the 1340s was called Easterlings Hall, or Esterlingeshalle. Wilton House is an English country house situated at Wilton near Salisbury in Wiltshire. It has been the seat of the Earls of Pembroke for over 400 years. The first recorded building on the site of Wilton House was a founded by King Egbert circa 871. Through the munificence of King Alfred, the priory was granted lands and manors until it became wealthy, however, by the time Wilton Abbey was dissolved in the Dissolution of the Monasteries set in motion by King Henry VIII, its prosperity was already on the wane. Following the seizure of the abbey, Henry presented it and its estates to William Herbert. William Herbert, the scion of a family in the Welsh marches, was a favourite of the king. Following a recommendation to King Henry by King Francis I of France, in 1538, Herbert married Anne Parr, daughter of Sir Thomas Parr of Kendal and sister of the future queen consort Catherine Parr and Sir William Parr, 1st Baron Parr of Kendal. The granting of a such as the Abbey of Wilton to Herbert was an accolade. The first grants dated March and April 1542, include the site of the late monastery and these were given to William Herbert and Anne his wife for the term of their lives with certain reserved rents to King Henry VIII. Lady Anne had been a joint creator of the enterprise, Herbert immediately began to transform the deserted abbey into a fine house and symbol of his wealth. It has long claimed, without proof, that Hans Holbein the Younger re-designed the abbey as a rectangular house around a central courtyard. Holbein died in 1543, so his designs for the new house would have to have been very speedily executed indeed, if not by Holbein, it is certainly by the hand of a great master. Whoever the architect, nevertheless a great mansion arose, today only one other part of the Tudor mansion survives, the great tower in the centre of the east facade. With its central arch and three floors of windows above, the tower is slightly reminiscent of the entrance at Hampton Court. The Tudor house built by William Herbert, 1st Earl of Pembroke, on the succession of the 4th Earl in 1630, he decided to pull down the southern wing and erect a new complex of staterooms in its place. Dorothy Savile, Lady Dorothy Boyle (1724–1742), Countess of Euston, and Her Sister Lady Charlotte Boyle (1731–1754), Later Marchioness of Hartington, National Trust, Hardwick Hall. Supplied by The Public Catalogue Foundation. Portrait of Douglas, 8th Duke of Hamilton, on his Grand Tour with his physician Dr. John Moore and the latter's son John. A view of Geneva is in the distance where they stayed for two years. Painted by Jean Preudhomme in 1774. During the Portuguese colonization of Goa, India brought about many churches with baroque architecture (Our Lady of the Immaculate Conception Church). The octagonal floor plan, Dome of the Rock. Courtyard in the Quetzalpapálotl ruin complex at Teotihuacan, 5th century AD. The Colosseum in Rome, Italy; the classical orders are used, but purely for aesthetic effect. The Maison Carrée at Nîmes in France, one of the best preserved Roman temples. A mid-sized Augustan provincial temple of the Imperial cult. The east front of Wilton, photographed by Queen Alexandra circa 1907. The central tower is all that remains of the Tudor house. Philip Herbert, 4th Earl of Pembroke, with his family, painted ca. 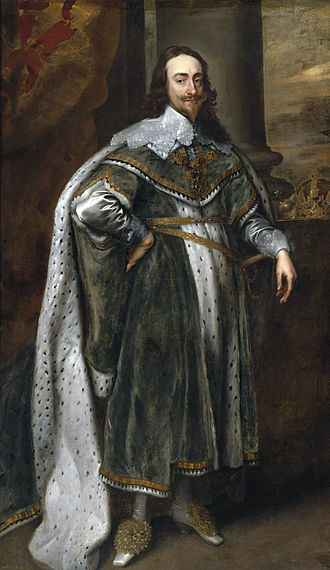 1634–35 by Anthony van Dyck.